I wish I had a dollar for every time a I car stops and gawks at it,” said Larry Olmstead, who owns a neat frame house up the road from the fantastic concentric on the opposite page. He has been watching the progress of his neighbor’s house with lively interest for the year and a half it has been under construction—the arrival and installation of a huge ball bearing from Germany, of the 60-foot Thermopane windows, of the quarry tiles and granite cobblestones from the Italian Dolomites. Architect Richard Foster’s new home is as controversial as a house can be—a big steel-and-glass carrousel on a cedar-shingled base that covers a core of precast concrete. Set in a raceway on top of the base is a three-ton ball-bearing assembly 13½ feet across—the kind that is commonly used to turn a crane or a big steam shovel. But this 6,000-pound bearing turns an eight-room house that weighs 500,000 pounds through 360 degrees of New England landscape. A switch controlling a 1½-hp electric motor sets the house revolving at a dignified pace of five feet per minute, or an even statelier crawl of nine inches per minute. Whether the house is turning clockwise or counterclockwise, a passenger experiences no sense of vibration and no tendency to vertigo. The curved glass walls bring four acres of varied and beautiful land into view—an apple orchard, a well-stocked pond, a grove of pines, a field of wild flowers. Foster’s brilliant conception was not easily executed. In a revolving restaurant all the utilities are stationary and only the diners swing into space. But in a house, the Fosters soon realized, the kitchen and 2½ bathrooms would have to move, too. Life would become complicated if one did not know where the bathroom had been left the night before. So everything swings except the base, where the front door and spiral staircase lead to the rooms above. Water, telephone and electrical lines enter the house through a central shaft within the stairwell and are distributed to the revolving areas through a swing valve, a commutator and a trolley, respectively, making it possible for the house to spin without breaking the service connections. Although tricky, these problems were minor compared with the one of sewage disposal. 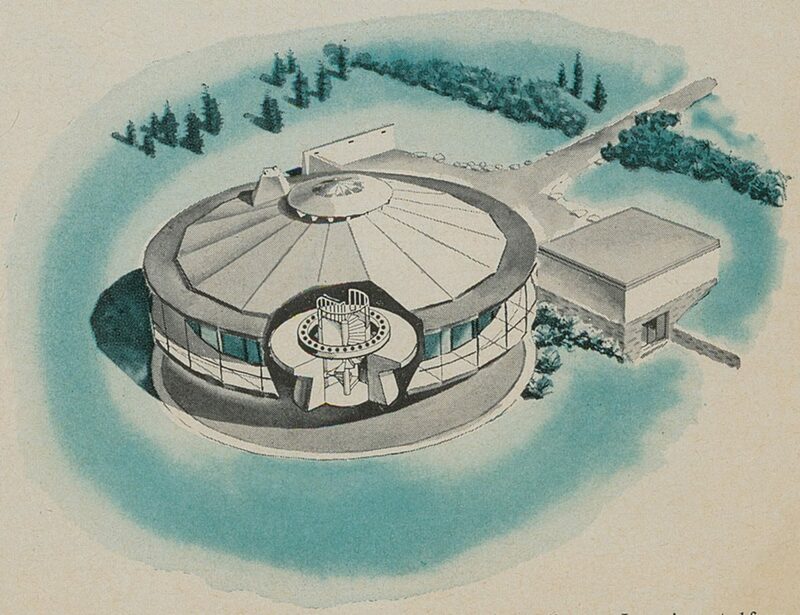 A lead-lined circular trough located in the base disposes of waste, which is flushed into it through a sealed channel that rotates with the house. 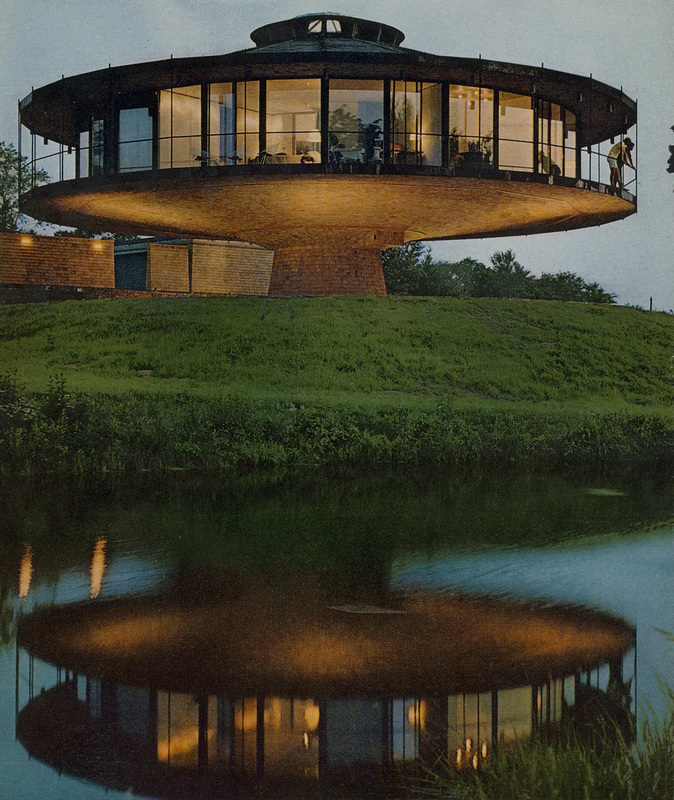 Like all prototypes, Foster’s house cost more than he expected, chiefly because of the size of the ball bearing and the machinery required to make a full 360-degree turn. But smaller, less costly bearings that do not have stairwells running through them or special sewage tracks on their peripheries give all sorts of new vistas to leisure architecture. Foster believes that rotation can solve the problems of building on lots crammed against palisades and along beach fronts. 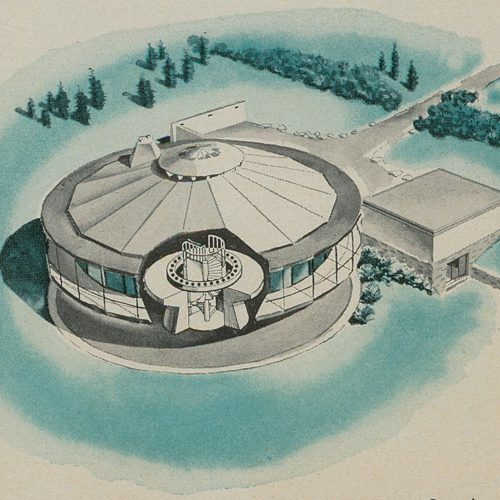 Systems that do not require a fully rotating house—and therefore a smaller ball bearing—should increase costs by only 20% over those of a stationary house. 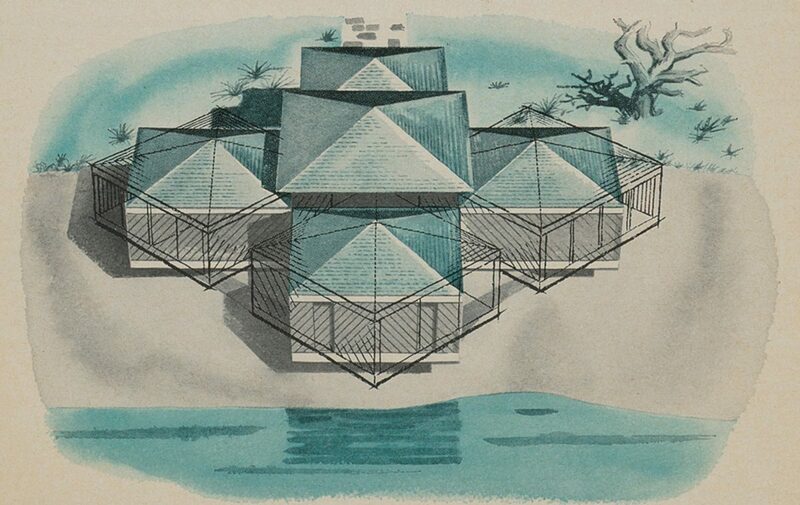 On the following page are two of the architect’s ingenious plans for cliffside and waterside vacation houses. 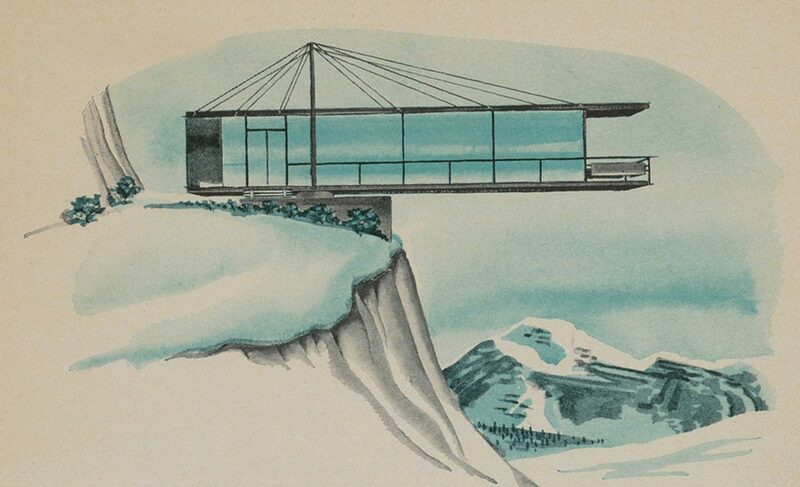 Idealized Eyrie is a Foster design for a steep lot on a palisade overlooking the water or a mountainside at a ski area. The 8-foot ball bearing is balanced top and bottom and is sufficiently strong to anchor a cantilevered house. 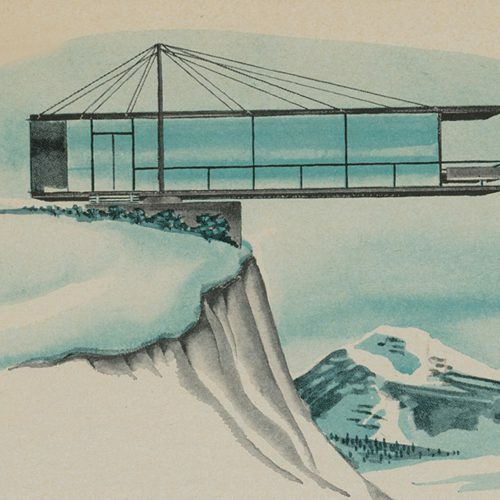 Suspended on a spiderweb of cables from two square steel beams, the house could swing anywhere from 90 degrees to 180 degrees, taking full advantage of sweeping mountain views. 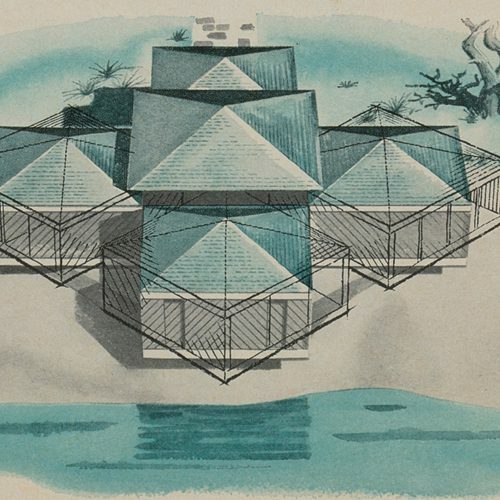 This design eliminates the ugly underpinnings that are so often required to hold up more conventional cliffside dwellings, and in fact permits building on previously unbuildable terrain. A two-level house could have a stationary level topped by a moving one. Triple turntables permit privacy in the cheek-by-jowl situation that exists on most waterfronts. Each of three cuboidal units swivels on 4-foot ball bearings. The fourth unit, stationary, contains the entrance and utilities. 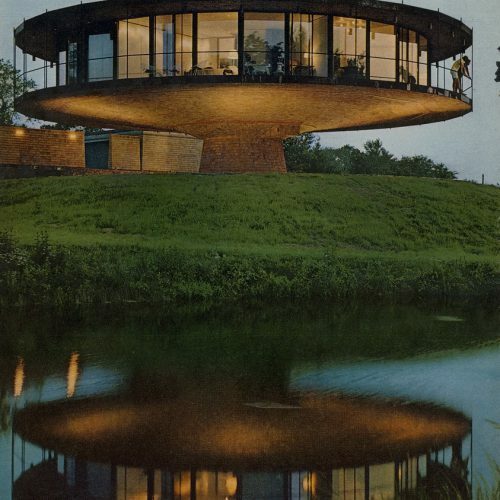 Two movable units contain bedrooms, and the third, facing directly on the water, the living and dining areas. Each unit turns to take advantage of prevailing breezes or sun. All turn inward to close up the house completely around an atrium sheltered by an umbrella roof. The bedroom units move 180 degrees and the living unit 270 degrees for maximum view. Shingled roofs and cypress siding would make this a moderately priced house.